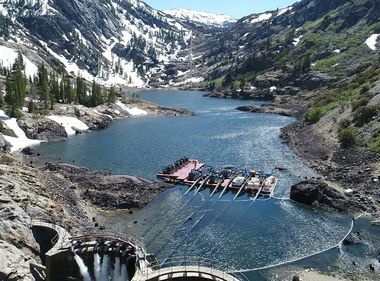 SCE snow surveys show recent storms contributed to a healthy snowpack that will help generate hydroelectric power this summer. SCE's snow survey team weighs the snow core sample at Mono Pass snow course. SCE's survey team treks in snowshoes to the Mono Pass snow course. An SCE helicopter flies the snow survey team up to Mono Pass at 11,450 feet elevation to measure the snowpack. 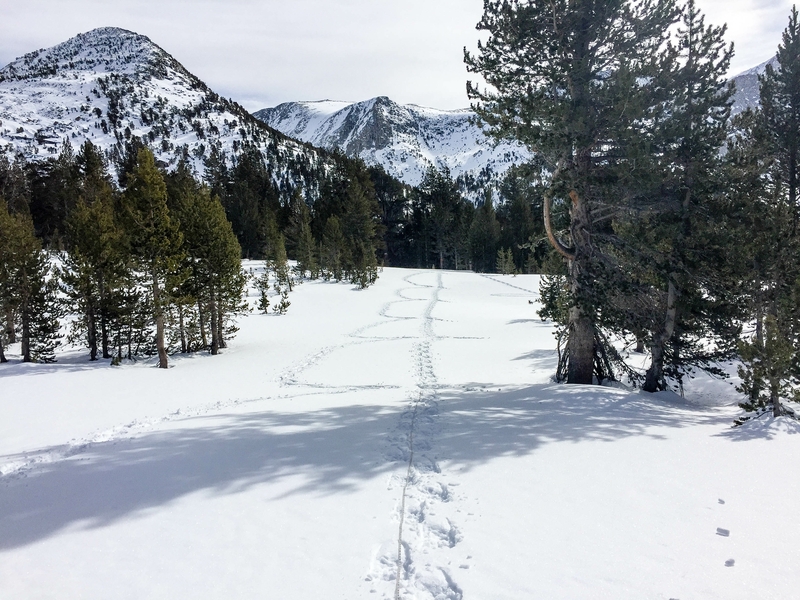 SCE's snow survey team made several "stabs" to measure the snow at Pioneer Basin, leaving a D-shaped trail behind. The view in late January from the Mono Pass snow course looking toward Pioneer Basin. 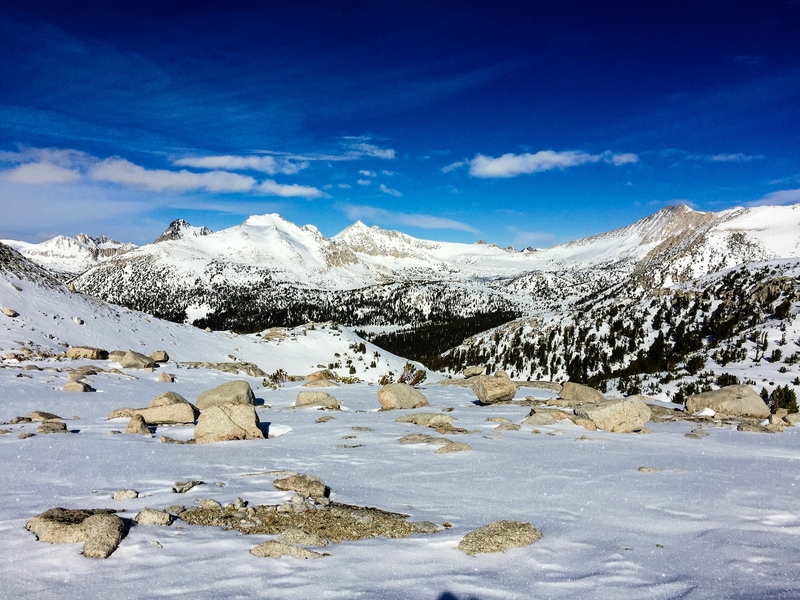 It was a crisp January day in the Sierra with the white snow setting off a dazzling blue sky above Mono Pass, but the Southern California Edison snow survey team didn’t have time to linger over the view. Their mission was to complete one of more than a dozen surveys the utility does at the end of every month during the winter to measure how much snow has fallen in the mountains. 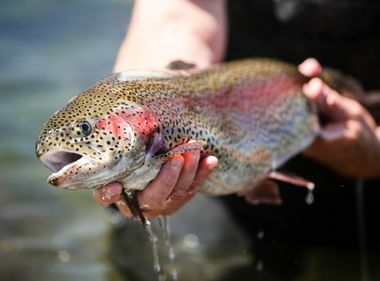 The Sierra snowpack provides vital water runoff throughout the spring and summer to generate clean and cheap hydroelectric power, fill reservoirs for visitors to enjoy boating, swimming and fishing and ultimately end up in the San Joaquin Valley below to be used by farmers and water agencies. SCE’s snow survey during the last week of January brought welcome news. The snowpack in the San Joaquin River Basin east of Fresno near the utility’s Big Creek Hydroelectric Project was at about 108 percent of normal for the last week of January, a little above the 100 percent of normal recorded statewide. Last year at this time, the snowpack was at 22 percent of normal. In the lower elevations around Big Creek, the snow was up to 32 inches deep, a healthy depth for relatively early in the season. Even better, those results didn’t include the series of storms that began the last week of January through early this month that dumped up to 11 feet of snow in places like Mammoth Mountain. 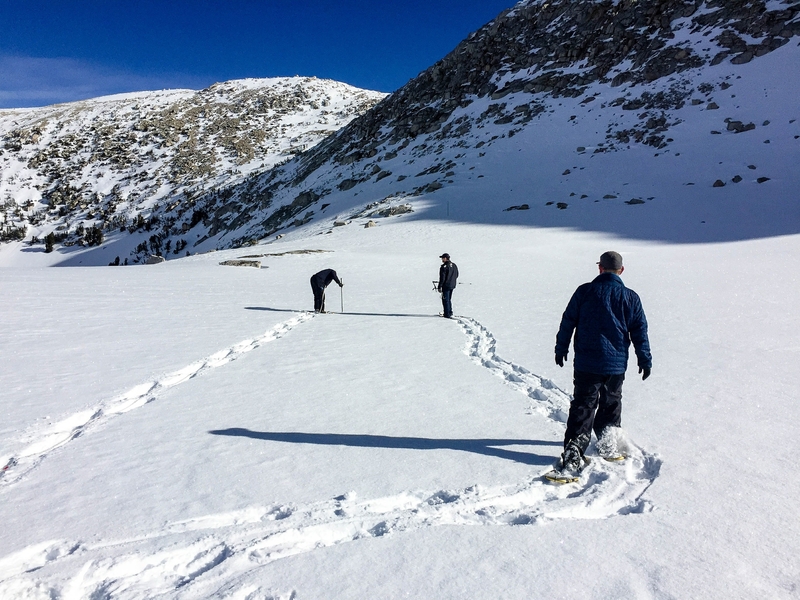 SCE's snow survey team makes several "stabs" to measure the snow at Pioneer Basin, leaving a D-shaped trail behind. 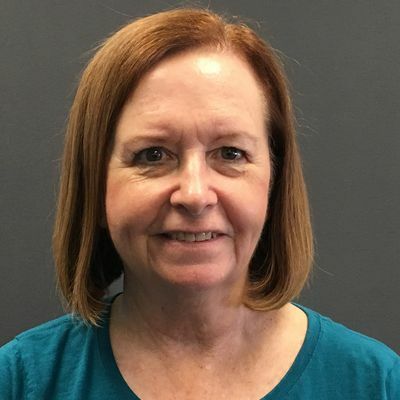 Although the snow isn’t as deep as it was two years ago, when monster storms brought the snowpack to a near-record 186 percent of normal, Jay Kimbler, a senior SCE supervisor in hydrography, called it a good start. “We are definitely much better off than at this point last year,” he said. It is also a major improvement over the worst of the drought years that began in 2012, when survey teams were as likely to be greeted by dirt as snow in the mountain passes and reservoir water levels fell to modern-day lows. SCE’s hydrographers gather snow data in the mountains around Big Creek and Bishop. The information is used by the utility for its hydroelectric planning, so it can safely manage the water levels at its dams and reservoirs while producing hydroelectric power. SCE’s data is also shared with state and federal water officials for their planning. The snow survey work is literally breathtaking with many of the snow courses at 9,000 feet or higher. Sometimes the team drives to the snow courses in a Sno-Cat. At higher elevations, they fly in by helicopter. Once they arrive at the snow course, they often have to trek in snowshoes or ski in through deep snow to get to the site where they take the measurements. The work is done with scientific precision, with the hydrographers seeking to replicate the exact place they do the measurements in every snow course during every visit. 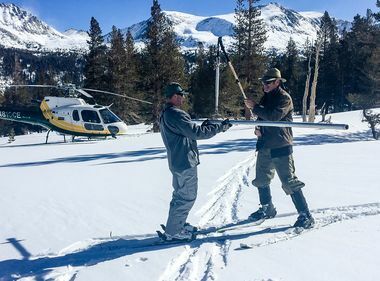 For the measurement itself, the hydrographers drive a 1½-inch hollow aluminum tube into the snow, adding additional sections of tubing until they hit dirt. They pull out the snow-filled tube, then use a handheld scale to weigh it, carefully recording each measurement. The January survey was SCE’s second for this snow season. Similar measures will be done later this month and in March. SCE’s final survey in April of 17 snow courses will provide the basis for the hydro projections for the spring and summer. Kimbler is encouraged by what he saw during the recent survey.